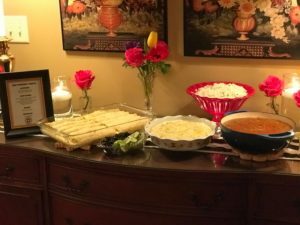 This weekend I had to opportunity to help my mom put together a birthday dinner for one of her dearest and closest friends, who is basically like family to us. The two met teaching next door to one another and instantly became life long friends. The two have a tradition of have each other and spouses over for the other’s birthday. Kim, my mother’s friend, is an outstanding cook and a gracious host. My mom usually takes the easy route and has her husband grill for the group, only this year, the grill had recently flame kissed it’s last steak and gone off to wherever grills go to die. While my mother is a good cook, she is nothing like my grandmother or even me. So while she was in a state of panic, I reassured her that I would come to town and save the day. I do best with a theme, so we landed on a fancy fiesta. I mean who doesn’t love a good fiesta? So enough about us, let’s get on to the party details. 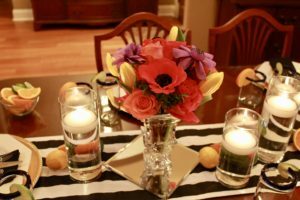 When planning the theme, I wanted it to be a fiesta with class. So hold the piñata. 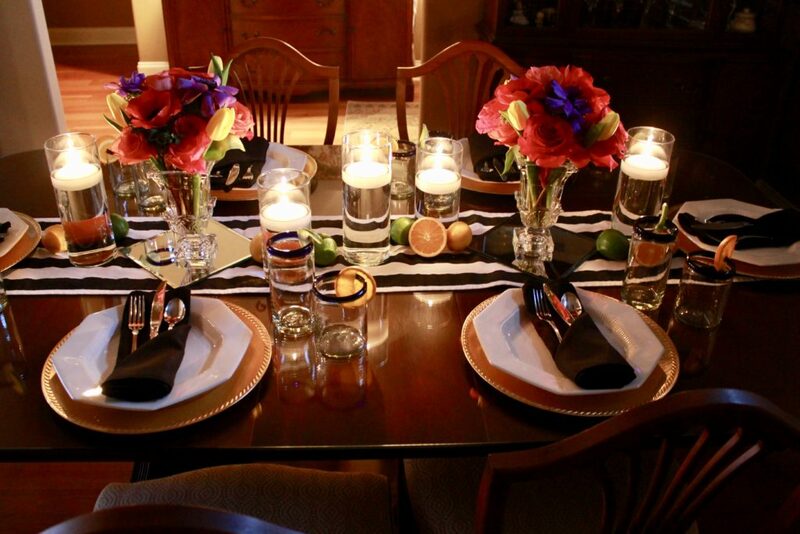 I chose a palette of bright fiesta colors plus gold and black accents to bring a little of the fancy. 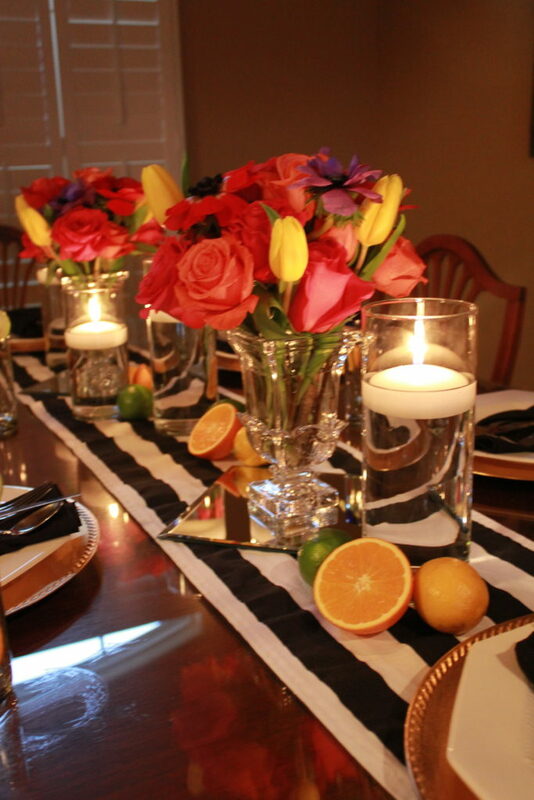 To start I picked a black and white stripe table runner for both the dinning table and the buffet. The black and white combo is such a classic and also helps as a background to make your color really pop. 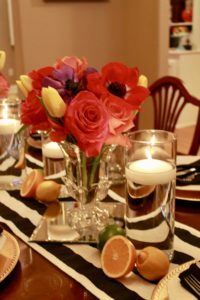 I chose to get the bright fiesta colors in the floral arrangements, using lots of hot pink, coral, yellow, red, and violet. I love to pick a variation of flower types to give different textures. When planning the arrangements, I first listed out the colors I wanted to include. With my list of colors, I then chose the types of flowers for each color. I always make notes of back up flowers, in the event that one of my choices end up being out of stock, too pricey, or just not in good shape. Placing the flower arrangements on mirror squares provided more interest with the reflection of all the colors as well as the flickering/dancing movement from the candlelight. 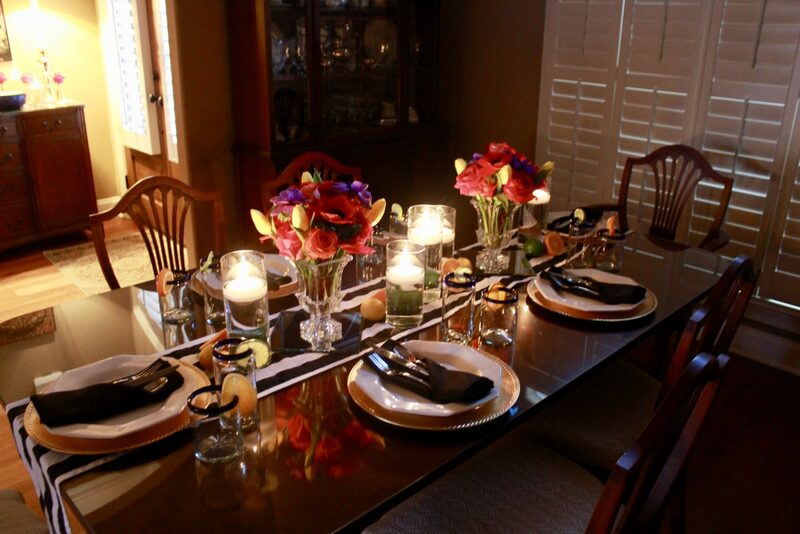 I like adding varying textures to my tablescapes. 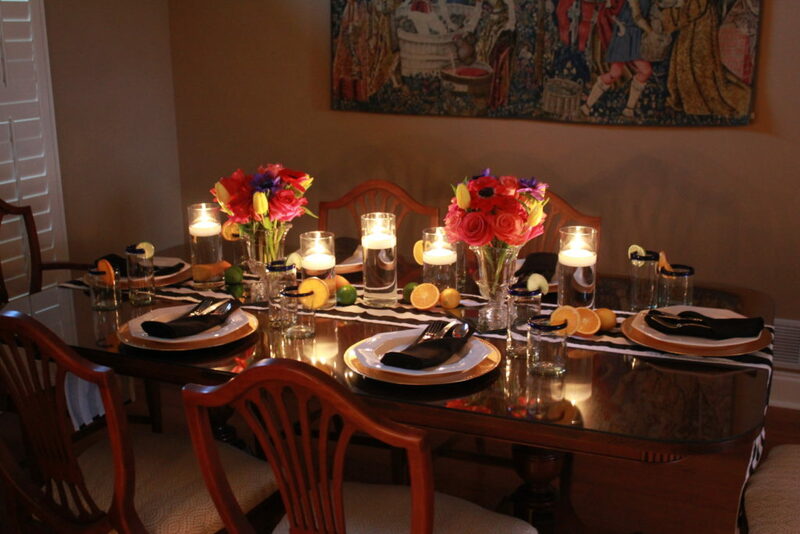 I added accents of lemons, limes and oranges at the base of the floating candles. This added an organic side to the tablescape and included some of the fresh ingredients used in the meal to be a part of the decor. I love having a lot of florals and candles at a party. 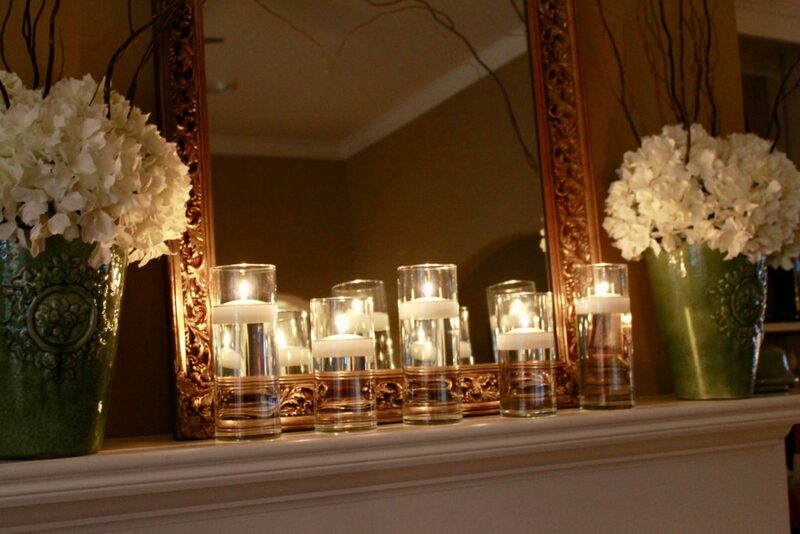 Candles are a great way to fill a space, but oh the ambiance they bring to the space. If you have the candle holders, candle can be a very cost effective way to decorate for a party. You will probably hear me mention this again. One thing that you do need to realize when you are planning your time line for party, most of your food needs to be served warm and should be prepared once your guest arrive. This is a great opportunity for a cocktail and appetizers hour. 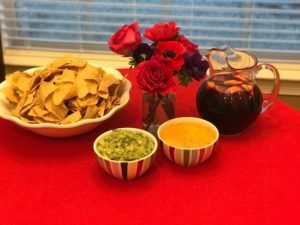 We went with a traditional guacamole and queso served with sangria. I always love this time of a party. It is when your guests first arrive and have so much to catch up on. It is really the warm up to the main event: the dinner. For the dinner, I selected a buffet style for the food service. This allows guest to get as much or as little as he or she desires. It also makes an open invitation for guests to go back for seconds or thirds, which opens up for compliments for your hard work. I like to put out a menu or food labels for guest to clearly know what is being served. To end the night, what truly is a party without cake? I, as DunkBakes, did a fiesta inspired cake. I love the artistic brush stroke look of this cake design and using all of those bright colors on one cake. 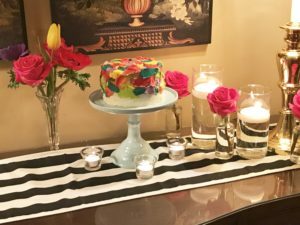 The birthday girl requested red velvet, so even the interior of the cake matched our color scheme. Be sure to leave your questions and kind comments in space below.